...Or high, if you're into yield. For the seventh day in a row, Greek bonds are down. They're now yielding 7.54% on ten year debt, a crippling number that has people panicking in multiple markets, across multiple asset classes. The cost of insuring against a default on Greek government bonds rose above that for Iceland for the first time. Credit- default swaps linked to Greek sovereign debt climbed 53 basis points to a record 466 today, according to CMA DataVision prices. Iceland, which got a $4.6 billion IMF-led bailout after its three biggest banks collapsed in October 2008, last traded at 402 basis points. I spoke with a super-nice Greek man the other day, and the debt situation came up. He said (and I paraphrase) "We will be fine, it's just that these bond vigilantes want us to pay interest rates that are too high." My response: "So Greece should borrow at the same rate as Germany?" Greek guy: "Yes, that's what is fair." My response: "So I should be able to borrow $100million at the same rate as Warren Buffett?" 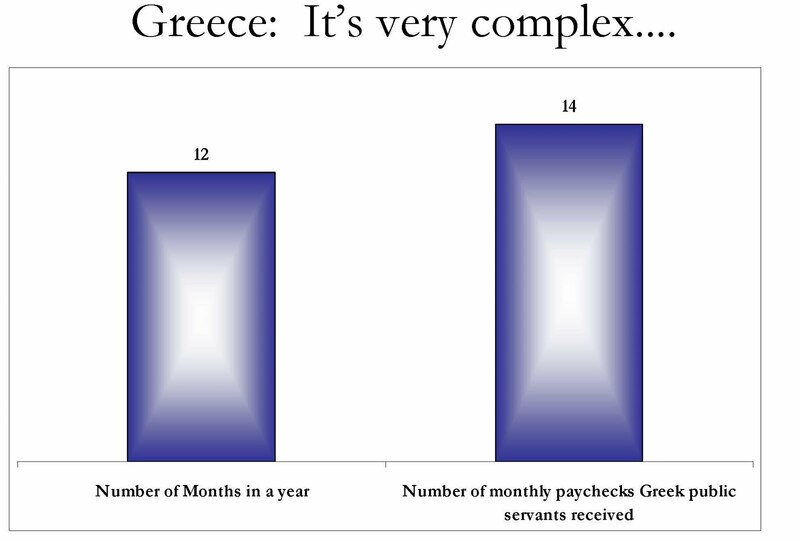 Greek guy: "I see what you mean but it's not that simple, you see Greece can't fix it's finances that quickly, because so many people work for the state..."
Nice guy, but they simply do not get it. Not even the Prime Minister gets it, as he blames his high interest rates on hedge funds, credit-default swaps, and even the Germans and World War Two. It's really simple, Greece. You used to borrow high. Then you borrowed low. Now you borrow high. Want to change that? Fix your finances, as Lithuania did. Faced with rising deficits that threatened to bankrupt the country,Lithuania cut public spending by 30 percent — including slashing public sector wages 20 to 30 percent and reducing pensions by as much as 11 percent. Even the prime minister, Andrius Kubilius, took a pay cut of 45 percent. And the government didn’t stop there. It raised taxes on a wide variety of goods, like pharmaceutical products and alcohol. Corporate taxes rose to 20 percent, from 15 percent. The value-added tax rose to 21 percent, from 18 percent. The net effect on this country’s finances was a savings equal to 9 percent of gross domestic product, the second-largest fiscal adjustment in a developed economy, after Latvia’s, since the credit crisis began. Again, here's my piece, "Analyzing the Greek Situation using incredibly complex Charts:" (this is not updated with today's 7.54% yield).